Diabetes like we all know, have been a common disease in this present time. It involves the accumulation of excess blood sugar, as a result of the system's inability to utilise or metabolise it. Diabetes, if left untreated or not properly managed can result into various complications that are detrimental to human health. Without further much ado, i will be giving out some useful healthy tips which you can use to avoid the complications of diabetes. Prevention like they said is better than cure. so, if you are diabetic, just follow this simple tips in order to prevent further complications related to this disease. Proper management of the body's weight helps in controlling blood sugars as well as maintain the overall health of our body system. Employing the assistance of your doctor, dietician and maybe a fitness trainer will go a long way in helping you to create a weight plan that will work for you. 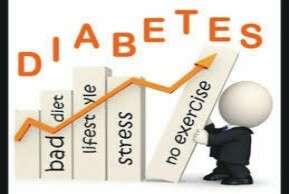 Another way of checkmating diabetes is regular assessment of your blood sugar level, preferably, twice in a day. Check to confirm it the result tallies with the range that is advised by your doctor. You can also note the result, so that you can track your progress and check which food and activity affect your blood sugar levels. In order to trace your average blood sugar level for the past two to three months, it is better you get an A1c test. People that are suffering from type 2 diabetes should be aiming at an A1c test of 7% or lower. For a perfect routine, ask your doctor how often you need to get an A1c test. Track your carbohydrates by knowing how many you are eating and how often you ate them. Managing your carbs intake can help you keep blood sugar under control. Opt for carbs that contains high fibre such as vegetables, beans, fruit and whole grains. Diabetes can easily complicates to heart disease, so it is advisable to keep a close track on your blood pressure and cholesterol levels. Seek advice from your doctor on how you can control your cholesterol, triglycerides and blood pressure levels. Stick to the medications, as prescribed by your doctor. Regular exercise will assist you in maintaining a healthy weight. In addition, regular exercise also helps you in cutting down stress and in controlling cholesterol, blood pressure, and triglycerides levels. Engage in at least 30 minutes of aerobic exercise for 5 days in every week. If you are not already used to exercise, you can start slowly with walking, dancing, or any low impact aerobics. You do not have to work out in the whole 30 minutes at a stretch, break it up into 10 minutes session throughout the day. As you are getting more used to it, include some strength and weight training into your routine. It is important that you should always remember to stretch after each exercise. When you deprive yourself from good sleep, you tend to engage in eating of more foods, which can eventually lead to putting up of much weight, complicating into further health problems. People with diabetes who get enough sleep often have healthier eating habits and improved blood sugar levels. Stress and diabetes are one two great enemy, they never agree. Excess stress is capable of elevating blood sugar levels. But you can get the relief you need by sitting quietly for 15 minutes, meditating or practicing yoga. It is proper for a diabetic to get a complete check-up at least once in a year, but you can always keep in touch with your doctor for other discussions and advice. At your annual check-up, ensure that you undergo a dilated eye examination, foot examination, blood pressure check, and screenings for other complications such as kidney damage, nerve damage, and heart disease. Following these few tips will help in preventing the complications of diabetes. Kindly share this information by using the social media icons below.